In a world where many choices and actions are made on the move it is increasingly important for businesses and employees to be able to operate as smoothly remotely as they can in the office. However going mobile can present security challenges – not so with IBM MaaS360. This software simplifies mobilising your systems and information without jeopardising your security. Why Kelros for IBM Maas360? With a wealth of experience and accredited technicians it is no wonder that Kelros has been rated as IBM’s top messaging and collaboration license re-seller in the mid-market UK for three years running. This just goes to show that by using Kelros to install and set up your IBM MaaS360 software you know you will be in safe hands. 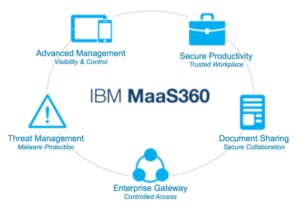 For more information about IBM Maas360 you can Contact Us. Alternatively, please request a Demo to have a Kelros consultant contact you today. How can manufacturers use collaboration to drive global growth? Download our infographic showing how Vispring, a leading UK manufacturer of luxury beds is working with Kelros to use its dual entitlement licences to migrate from IBM Domino to IBM Verse and IBM Connections Cloud. Franchise business OSCAR was using a fragmented combination of Lotus Notes and personal email addresses to communicate with customers and each other. Kelros introduced IBM Verse to bring all email and calendar systems under the company brand – enabling more informed sales, and setting OSCAR apart. Kelros helps Westlea Housing Association raise the standard.